1 For many young people, a savings account is their first banking experience (unless you count those lollipops you got at the drive-up window with Mom or Dad). A bank account in which children deposit money and watch their savings grow can be an early lesson in the importance of making good financial decisions. 2 For teens, savings accounts can be especially important once they begin to earn money on their own. 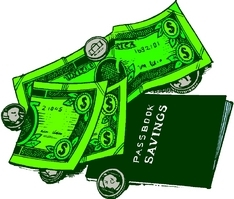 Those savings accounts might represent savings for a first car or for a college education. And for adults, savings accounts are a practical way to save for occasional large expenses such as an unexpected plumbing repair or a family trip to watch your favorite football team compete in a big game. So it is probably a good idea to know something about how a savings account works. 3 First of all, do you know what the bank does with your money after you deposit it? Banks don't just keep your money locked up in their safe until you ask for it back. They loan it out to other people. The money you deposit in your account might be passed on to someone for a new car loan or for a mortgage on their first house. From many years of doing business, bankers know how much money they will need to keep on hand for day-to-day business and how much they can lend out. Feedback on How Does a Savings Account Work?